John Shortland (1739 – 1803) was born near Plymouth, son of John Shortland, senior member of a Devonshire family, six members of whom were associated with colonisation of Australia and New Zealand. In 1755 he entered the Navy as Midshipman and served under Admiral Edward Boscawen off Newfoundland, under Admiral John Byng off Minorca and under Admiral Sir George Rodney in the West Indies, being present at the resumption of several islands. On promotion to Lieutenant in 1763 he was engaged in transport service between England and America. By 1782 he was in command of transports taking reinforcements to the relief of Gibraltar and in 1786, after returning with troops from Halifax, was appointed Naval Agent for the Transports of the First Fleet sailing for New South Wales. In this responsible post he was charged with the oversight and proper fulfilment of Contracts for Transport, the Master of all the transports were under his command and he directed provision of bulk-heads and cabins for accommodation of soldiers and convicts. Since Governor Phillip was detained in London until 11 May 1787, just two days before the fleet sailed, attending to the many details connected with the expedition, a large part of the preparation and organisation of the Fleet fell to John Shortland which he ably and efficiently carried out. He also arranged appointment on the Expedition for his two sons, John and Thomas. After the Fleet sailed from Cape Town, having called at Teneriffe and Rio de Janeiro, Governor Phillip transferred from the Flagship Sirius to the tender Supply and in company of the three fastest transports under Shortland in Alexander sailed as an advance party, being first to reach Botany Bay on 18 January 1788. John Shortland remained in Port Jackson supervising discharge of stores and equipment until 14 July 1788 when he sailed from England on Alexander carrying the first Dispatches from Governor Phillip to the Secretary of State. Alexander 448 tons, was accompanied by Borrowdale 272 tons, Prince of Wales 334 tons and Friendship 276 tons, the latter being subsequently abandoned en route. During the adventurous voyage home by way of Batavia, Shortland discovered and charted many islands and reefs including the dangerous Middleton Shoal east of Cape Byron NSW arriving back in May 1789. During his absence he kept a full journal of transactions and observations which was highly valued by the authorities. Promoted to Commander in 1790, he saw further active service until retiring to Lille, France, where he died in 1803 aged 64 years and leaving a widow, two sons and two daughters. A fine seaman and capable officer, Shortland appears to have specialised in transport and supplies during the greater part of his service in the Navy. He has on at least two occasions been confused with his better know son John Jnr, firstly at the Discovery Celebrations of the Hunter River and secondly at the 150th Anniversary of the event in 1947 when the Postal Department issued a stamp showing the face of the father instead of his son. 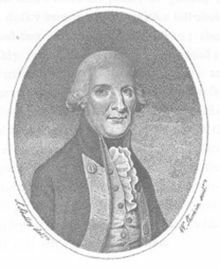 John Shortland (1769 – 1810) born 5 September 1769 was the eldest son of John Shortland, Agent for Transports in the First Fleet. In 1781 he joined the Navy as Midshipman and went to Quebec on a transport commanded by his father. From 1783 to 1787 he served in the West Indies, first in Surprise then in Latona. In 1787 he was appointed Master’s Mate in Sirius the flagship of the First Fleet. 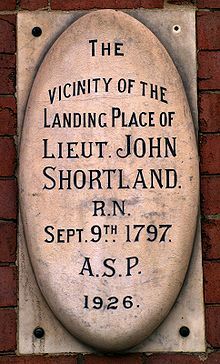 Shortland spent nearly five years in Australia on this occasion, including 11 months on Norfolk Island where Sirius was wrecked in 1790. In April 1792 he returned to England with Captain Hunter and the next year was promoted to Lieutenant in Arrogant. On 7 September 1785 he returned to Australia with Governor Hunter as First Lieutenant on Reliance, his shipmates including George Bass and Matthew Flinders. As senior officer of his ship he was unable to join in their journeys of discovery later. In September 1797 he was sent in charge of two whaleboats north along the NSW coast to search for a group of mutineers who had seized the Government’s largest ship Cumberland and escaped to sea. He went as far north as Port Stephens, noting on the way a river entering the sea near a small island. Northing more was heard of Cumberland or its crew but on the way back to Sydney, on 9 September 1797, Shortland entered the river which he named ‘Hunter’ in honour of the Governor, made a sketch of the estuary, noted a suitable site for a town where Newcastle now stands and collected some samples of coal which he took back to Sydney. In 1797 he was granted 25 acres of land at Liberty Plains and later, a further 300 acres at Bankstown. However Shortland found the steady naval duties ashore and service on the Criminal Court rather tiresome and preferring the excitement of active service, returned to England in Reliance leaving Sydney 3 March 1800 and arriving 26 August 1800. Altogether he had spent nearly 10 years in New South Wales. Appointed Agent for Troops under Abercrombie he went to Egypt, served in Dolphin and Trompeuse and was then ordered to the Guinea Coast where on the death of her captain, he took command of Squirrel. In 1805 Shortland joined the Halifax Station under Admiral Warren as Post Captain of Junon a captured 40 gun French frigate fitted out partly at his own expense. On 13 December 1809 he fought a gallant but hopeless action against two 48 gun and two 20 gun French ships. He was very seriously wounded and his ship so badly damaged that the French decided to burn her. He was taken to hospital at Guadeloupe in the Winward Isles by the French and he died 21 January 1810, aged 40 years. He was buried by the French with full military honours at Basse Terre, Guadeloupe. He was not married. 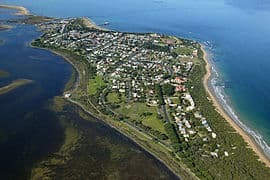 Named after Lieutenant (later Captain) John Shortland (1769-1810) who in 1797 aboard HMS Sirius discovered the estuary of the Hunter River while searching for escaped convicts. The main campus of the University of Newcastle is in Shortland. 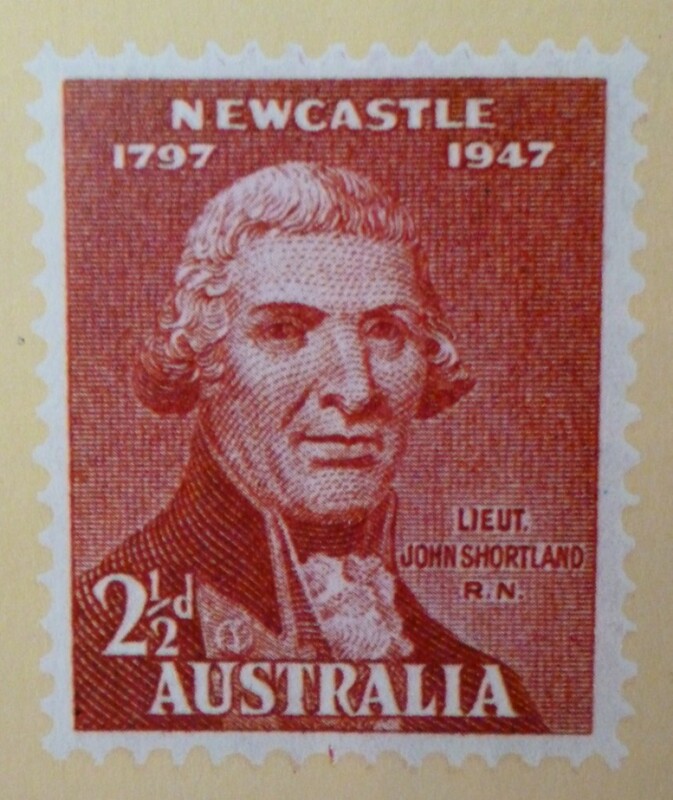 When the Australian stamps were issued for the 150th anniversary of Newcastle, New South Wales, a mistaken identity was discovered on the Newcastle 1797-1947 Lieut. John Shortland, R.N., 2½d stamp. It transpired that the illustrator of the stamp had used a painting of the father as source material. The two men bore the same name, but John Shortland snr, the man on the stamp, did not discover the Hunter estuary site of Newcastle. 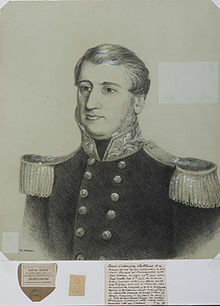 Thomas George Shortland (1771 – 1827), second son of John Shortland Agent for Transports with the First Fleet is not as well known as his elder brother. Early in 1787 he was appointed a junior officer on Alexander, the transport in which his father came to New South Wales. He remained with the ship and returned to England with it. During the voyage by way of Batavia, July 1788 to May 1789, under directions from his father, he made an accurate and detailed chart of the route taken by the ship and which received admirable comment. Following his return to England he joined the Royal Navy and reached the rank of Captain. He had at least three sons, Willoughby, Peter and Edward. Thomas Shortland died in 1827, aged 56 years. Willoughby Shortland (1804 – 1869) son of Thomas George, entered the navy in 1818 and in 1839 accompanied Lieutenant Governor William Hobson to New Zealand, where after Hobson’s death in 1842 he administered the government until the arrival of Captain Robert Fitzroy in December 1843. After serving in the West Indies he returned to England. Willoughby Shortland died in Devon on 7 October 1869. Edward Shortland (1812 – 1893) son of Thomas George was born in Devonshire and educated at Cambridge where he graduated in arts in 1835. He then studied medicine. In 1841 he was appointed private secretary to Governor Hobson, and in 1842 protector of aborigines, and in these capacities did good work in New Zealand for a number of years. After a time as Physician in Auckland he returned to England. Edward Shortland died in Plymouth on 5 July 1893. Peter Frederick Shortland (1815 – 1888), son of Thomas George, joined the navy in 1827 (lieutenant 1842; commander 1848; captain 1859; rear-admiral 1876; vice-admiral 1881) and in 1836-8 served aboard HMS Rattlesnake in Australian waters. 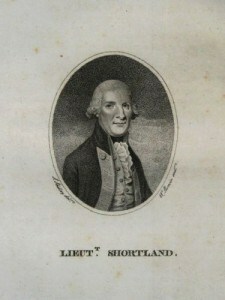 He assisted in the survey of Port Phillip and the headland now known as Queenscliff was called after him Shortland Bluff. In 1838 he obtained leave of absence to study at Cambridge and completed in 1842 a distinguished mathematics course. He was then appointed to surveying duties on the coast of Nova Scotia, and served in those waters until 1865. Peter Shortland died at Plymouth on 18 October 1888.